The first Godzilla was a childhood favorite when it played on TV; it actually has a fairly atmospheric black-and-white look. I also loved the early Disney animated features. By high school, I was a big fan of the original Star Trek series. But the biggest impact came from seeing Close Encounters of the Third Kind in a movie theater when I was 15. It was the ultimate cinematic experience of my youth. I’m still in awe of that movie. Vittorio Storaro, ASC, AIC; Gordon Willis, ASC; Conrad Hall, ASC; Geoffrey Unsworth, BSC; Jack Cardiff, BSC; Gregg Toland, ASC; David Watkin, BSC; Gabriel Figueroa, AMC; Néstor Almendros, ASC; Robert Richardson, ASC; Roger Deakins, ASC, BSC; Allen Daviau, ASC; Freddie Young, BSC; Vilmos Zsigmond, ASC; George Barnes, ASC; and Jordan Cronenweth, ASC — to name a few. My father always has been an avid photographer, so it was part of my childhood. In high school, I remember first learning about cinematographers when I noticed that Superman: The Movie was dedicated to the late Geoffrey Unsworth. I loved his pastel, fog-filtered work on that movie and managed to find the American Cinematographer article that his operator, Peter MacDonald, wrote about working with him. What deeply impressed me was the admiration that directors and crews who had worked with Unsworth expressed for him as a human being and an artist. I started making Super 8 movies when I was in high school and didn’t attend film school until I was 27, so a decade of self-learning passed before I got any formal training [at CalArts]. I arrived at film school more or less proficient with the basics of camera and lighting, and I was asked to shoot dozens of graduate-thesis projects for other students. So what I learned in film school was less about technical matters and more about working with directors and crews. I relied heavily on back issues of American Cinematographer as my private film school; I read every issue going back to the late 1920s and re-read the 1970s issues (a great period for the magazine and for movies) numerous times. At CalArts, my graduate-thesis adviser and mentor was Kris Malkiewicz, author of the textbook Cinematography, which I had actually memorized a decade before meeting him. I recently got to collaborate with Kris on a new edition of that book, a great honor. My mother is Japanese, and living in a house with Japanese art on the walls certainly influenced my early aesthetic development — as did, perhaps, the many Japanese monster movies on TV. Growing up in the California desert had some impact on my sense of space and light. I love the paintings of Hopper, Caravaggio, Vermeer, Rembrandt, Sargent, da Vinci and Van Gogh. I’m also a big fan of American landscape paintings, particularly by the Hudson River School. The work and ideas of Vittorio Storaro have always been a major inspiration. My favorite directors are Kurosawa, Kubrick, Lean, Ford, Welles and Hitchcock — the usual suspects! I started shooting features right after film school, mainly micro-budget projects that I got through connections made in school. The budgets have slowly climbed over time. The first movie anyone noticed was Twin Falls Idaho, and then Northfork. Both were directed by Michael Polish, and both netted me Independent Spirit Award nominations. Doing a crane shot in 35mm anamorphic on the vast plains of Montana in the winter for Northfork. It was the closest I’ve felt to doing work in the spirit of John Ford and David Lean, despite the tiny budget. Early on, I moved a 5K that I probably shouldn’t have touched and unknowingly placed it under a fire sprinkler, which went off in this very expensive mansion. I expected the owner to throw a fit when she saw her drowned master bedroom, but it turned out she had been hoping something would go wrong. Apparently she had a habit of renting out her mansion to productions whenever she wanted to get some remodeling done, figuring that they would damage something and she’d get money from the insurance claim. I was nervous about shooting my first feature, and luckily, I ran into Allen Daviau, ASC, who advised me to know my first week of production, what I needed to do, backwards and forwards. I discovered that being hyper-prepared like that not only boosted my confidence but also set the right tone for the production. The crew quickly realizes that you know what you want and are aware of how long things should take. I find some of the locations where I have worked to be very inspiring. Most recently it was the Santa Fe region of New Mexico. In the past few years, Robert Richardson’s cinematography for Snow Falling on Cedars has probably impressed me the most, as well as Conrad Hall’s work in Road to Perdition. Shooting a science-fiction movie set on a spaceship would satisfy a childhood dream, especially if it were a Star Trek movie. Like many cinematographers, I’d love to shoot a Western, a black-and-white film noir, and a period epic in 65mm — not necessarily in that order. I’d probably be teaching filmmaking. If not, I might be trying to make a living as a writer. Robert Primes, Roy Wagner and Denis Lenoir. 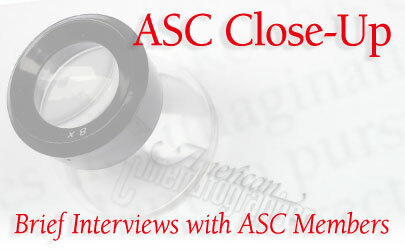 For one thing, I got to cross “get into the ASC” off my list of lifelong career goals! It has been a tremendous honor and a great pleasure to meet and socialize with my heroes, some of whom were responsible for the greatest moments in cinema history. It’s a wonderful organization of true artists.